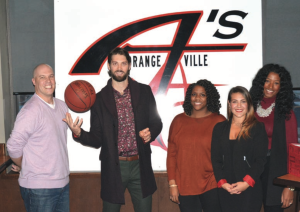 The Orangeville A’s will start off the 2015 National Basketball League of Canada season in their new venue at the Athlete Institute on Highway 9, just east of town. The A’s, formerly the Brampton A’s have renamed the team and moved to Orangeville bringing professional bas- ketball to local fans. The Athlete Institute has been doing renovations to accommodate the team including additional bleachers and box seats in the gym mezzanine. The team also has a new coach – Chris Thomas, who was a scout for the Utah Jazz last season and former assistant coach with the Golden State Warriors. “This is my first year outside of the NBA in quite a while,” Thomas said of making the move to the NBLC. The A’s are owned and operated by the Tipping family, who also own the Athlete Institute, with patriarch James Tipping at the helm of the organization. “With the ownership and this family being so tied into the community, I think it’s vital that you come back here and put forth a product that the Town of Orangeville can be proud of,” Thomas said. The team has seven returning players from last season. The A’s home opener will take place at the Athlete Institute on New Years Day, January 1, 2015, with a 7:00 p.m. tip off.